Line Morissette began working as a Nurse at CSSS Champlain‒Charles-Le Moyne in Greenfield Park in 1980. She has acquired more than 35 years of experience in a variety of demanding fields, including traumatology, obstetrics, abdominal surgery, orthopedics and endoscopy. She is a passionate nurse who continues to be fulfilled by her work. 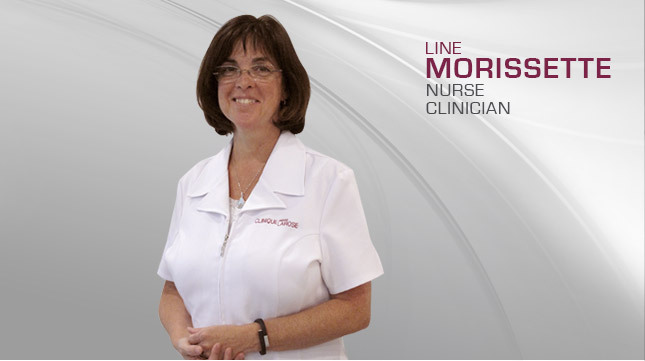 In addition to her experience at Hôpital Charles-Le Moyne, Line has been working in sclerotherapy at a private clinic since 1992. She joined Dr. Larose’s team in January 2010, and her extensive experience is a valuable asset for the entire clinic.